Join the Pure Nature Four Seasons Loyalty Club to receive special promotional codes for your first visit and generous benefits when you return. Again and again. 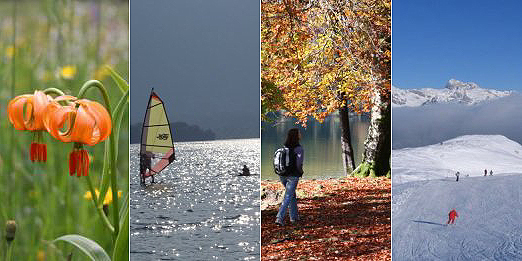 Enjoy your holidays at Lake Bohinj, surrounded with pure nature. The woods, the lake and high mountains are your neighbours and friends. They fill you with the energy you need in today's stressful daily life. In summer, in autumn, in winter and in spring. Every season brings something special. We will send you occasional newsletter, containing information about interesting events and activities in our area and special packages, available to guests of Hotel & Villa Stare. We will attach special promotional codes in newsletter you receive. Pure Nature Four Seasons Loyalty Club adds more value to your next visit... and the one after that... Come awaken your senses and enjoy all nature has to offer all year round. Once you're a member of the club you'll start earning rewards points which accrue until you use them and they'll never expire! For every 1€ you spend you earn 1 point. You will earn points on overnight charges and food and beverage charges. Upon enrolling in the program 1.000 bonus points will be added to your account! You will be informed of special promotional periods where you can earn double, or even triple points! If you enroll at the end of your stay with us, the points earned from that stay will be added to your account. The conversion value of points to EUR is 1%. For example, 100 points accrued equals 1€ you can spend. There is a 30 day waiting period from the time of enrollment to use your 1,000 enrollment bonus points. By submitting this form, you agree to receive occasional newsletter from Hotel & Villa Stare. We will not share or sell your email information with any third party organization. You may cancel your membership in the Pure Nature Club at any time.